At a glance Reward yourself with the Disney Visa Card. 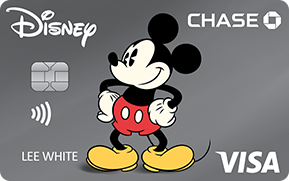 Earn 1% in Disney Rewards Dollars on all card purchases. * Same page link to Offer Details Redeem toward most anything Disney at most Disney locations. Enjoy special vacation financing and shopping savings. * Same page link to Offer Details Terms apply. Earn 1% in Disney Rewards Dollars on all your card purchases with no limits to the amount you can earn. Already have a Disney® Visa® Card? Get 100 Disney Rewards Dollars for each friend who gets the Disney® Visa® Card. Click the button to ensure you receive the above offer. Restrictions apply. Redeem Rewards Dollars toward most anything Disney and Star Wars at most Disney locations, including Theme Park tickets, Resort stays, shopping, dining and more. This product is not available to either (i) current cardmembers of this credit card, or (ii) previous cardmembers of this credit card who received a new cardmember bonus for this credit card within the last 24 months. You must apply using the application link on this page to be eligible for this offer. In some instances, an application may require additional time to process. This offer is limited to a one-time award for new cardmembers of a $100 statement credit after First Purchase with the Disney Visa Card. ("First Purchase" does not include balance transfers, cash advances, travelers checks, foreign currency, money orders, wire transfers or similar cash-like transactions, lottery tickets, casino gaming chips, race track wagers or similar betting transactions, any checks that access your account, interest, unauthorized or fraudulent charges, and fees of any kind, including an annual fee, if applicable.) To be eligible for this bonus offer, account must be open and not in default at the time of fulfillment. Please allow up to 8 weeks after your First Purchase with the card for this credit to appear in your statement.